Albin Julius returns with some familiar cohorts in the Church of the Leading Hand, on this latest affair, ‘Joyride’; which comes on Black Vinyl, Blue vinyl and compact disc (so there are plenty of options for collectors out there). Opener, ‘Drive Me Far’ has a touch of the 80’s soundtrack to it, reminding me somewhat of John Carpenter in its simplistic, yet effect atmospherics musically. Marthynna’s vocals add a psychedelic symmetry to the proceedings, in a hypnotic chant fashion. ‘Sea of Love’ utilises a synthetic edge to a somewhat muggy guitar production that works surprisingly well in providing an aged sound to the recording. This follows suit on the trippy ‘Falling out of Time’, relying on its character coming from the vocals alone. ‘Joyride’ has a number of strengths that come from unusual sources. 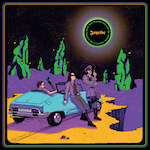 The electronics have been utilised in such a fashion that whilst being overtly modern in sound, revert (speaking in a programming sense) back to another era; to match the 60’s/70’s feel to the guitar work and production that make the listener feel like they’re on one long acid trip. Whilst it’s not an age I take pleasure from musically on a personal level, there is something about this album that hooks me in. I do prefer Der Blutharsch when they’re at their militaristic best, and this album does end on a high, with the chants flowing like a drone, nodding somewhat martially at other works by Julius. Lovers of Krautrock will lap this album up and as a whole this is pleasing to the ear; I just await something more tangible and solely Der Blutharsch to sink my teeth into. Albin Julias has been pedalling Der Blutharsch for many a year now along with his many appearances with other artists in associated genres, such as the likes of Death in June etc. Once again we have the almost alter ego of his main project, in the form of The Infinate Church of the Leading Hand; and in some respects this is where I feel Julias’ works at his best, producing an array of remixes he has worked on for other and collaborations, rather than a straight forward new release for the band. The title track opens up this album in ritualistic fashion, with harmonious dual vocals and airy, well pitched ambient; glorious and uplifting, there is a real synergy that melds well between the soil of the earth and ascendance to the heavens capturing everything that is good about two projects working together and the fusion with White Walls works well. In stark contrast, a remix of Phallus Dei’s ‘Will You Come Now?’ fuses Anti-Pop and Post–Punk sensibilities into a warming array of staggering bass, subtle guitars and early eighties vocals that you can really latch onto and feel yourself singing along with in no time at all. Folk music has always played its part in much of Julias’ work and once again this latest Blutharsch release (of sorts) is no stranger to its appearance, but this time in the form of a remix for the almost legendary band, Changes. Given that this album features so many other artists along the way, it pains me to say it, but I appreciate this album more than a lot of Der Blutharsch’s previous affairs; enjoying Albin more, as always, when he works on other related artists’ albums in collaboration. 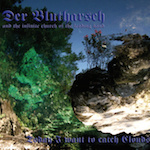 Overall, ‘Today I Want to Catch Clouds’ is an excellent introduction for those that have not taken it upon themselves to listen to Der Blutharsch; providing a distinct variation in approach along the way that should appease those that listen to a multitude of different styles of music, escaping the confines of the tunnel vision attitude we have witnessed in this scene time and time again.